Cedar Rapids, IA - February 5, 2015 - U.S. Marshals arrested a Cedar Rapids man in Chicago today wanted on charges related to burglary and trafficking stolen firearms. Brandon Robertson,19, failed to appear for sentencing in October 2014. Following the incident, the U.S. Marshals Service Northern Iowa Fugitive Task Force (NIFTF) was requested to assist in the hunt for Robertson. 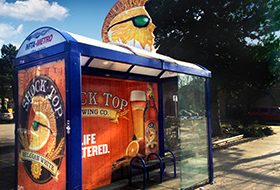 In January, the NIFTF partnered with Lamar Advertising Company to make the public aware of Robertson's fugitive status. 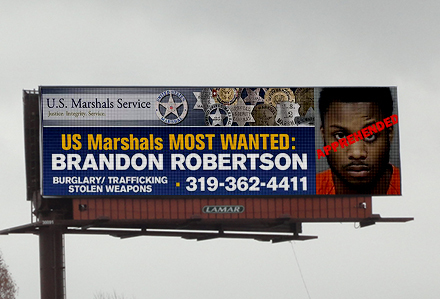 Shortly after Lamar Advertising published Robertson's "Most Wanted" status on digital billboards throughout eastern Iowa, the public quickly responded with phone calls coming in to the local US Marshals Fugitive Tipline. NIFTF members narrowed the search for Robertson to a residence in the vicinity of the 4100 block of South Prairie Avenue in Chicago. NIFTF members coordinated with the US Marshals Service Great Lakes Regional Fugitive Task Force along with members of the Chicago Police Department to apprehend Robertson. Robertson quickly surrendered to the Marshals, and was taken into custody without incident. The U.S. Marshals Service is the federal government’s primary agency for fugitive investigations. 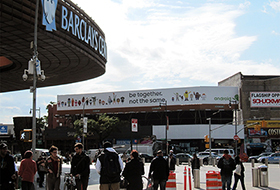 Nationwide, 60 local task forces are dedicated to violent crime reduction by locating and apprehending wanted criminals. These task forces also serve as the central point for agencies to share information on fugitive matters. The Northern Iowa Fugitive Task Force is comprised of officers from the US Marshals Service, the Linn County Sheriff’s office, Cedar Rapids Police Department, and the Iowa Department of Criminal Investigation.